Protect entrance to the Black Garden. The Virgo Prohibition is a Vex programming collective situated on Mars. Prohibition units can be identified by their dark, metallic-blue frames. This aggressive and relentless Vex Collective is in constant conflict with the Cabal, repeatedly testing the Cabal's Exclusion Zone without regard to their own losses. In spite of the Vex onslaught, the Cabal have managed to expand their Exclusion Zone and control several Vex structures. The Virgo Prohibition's tactics seem to be failing in the short run but due to the nature of the Vex, it is possible that the Virgo Prohibition is simply drawing out the Cabal's strength (as evidenced at Bastion) and that their losses could be a distraction from a deeper strategic ploy, as it seems unlikely that such an intellect as the Vex could be dragged into a losing war of attrition. Recent events have borne this out as the Prohibition began appearing in greater number in Meridian Bay to protect the Black Garden. The ultimate goals of this programming remain a mystery but Ikora Rey proposes Vex units can best be described as algorithms, and that the Virgo Prohibition may be the wrong algorithm for the environment, leading to the idea that continued losses will drive the greater Vex network to adapt and improve. 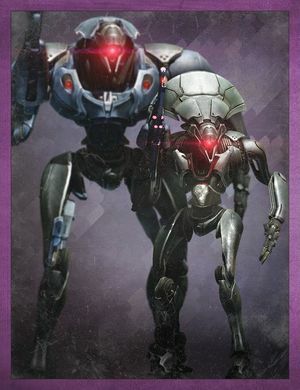 During the Red War, the Vex would inform Ghost that the Virgo Prohobition were, in fact, incorrectly programmed for their task on Mars - indicating that the Prohibition have not been losing against the Cabal as part of a deeper strategic ploy. Praetorians are a part of this Collective, which is unusual because Praetorians are encountered exclusively on Venus and defending the Vault of Glass. It could be because of the timeless nature of both the Vault and the Black Garden that is the result of this. As of namesake-wise, the Prohibitive Mind is likely the leader of its collective.